Bone, like muscle, is an adaptable tissue capable of repair, regeneration, and remodeling in response to environmental (particularly mechanical) signals. Bones are exposed to both stress (ie, load) and strain (ie, deformation) with weight-bearing exercise. One measure of load is GRF, which can approach 12 times body weight during jumping and landing. Factors influencing the local skeletal response to loading include bone geometry and bone density. For example, cortical (ie, long) bones are generally more resistant to compressive forces than trabecular bones, but long bones also experience more strain in response to torsion or bending forces. In addition, a bone's strength is roughly proportional to the square of its mineral density; thus, osteopenic bone is weaker than bone of normal density. Wolff's law states that bone develops the structure most suited to resist the forces acting upon it. The ability of bone to remodel has tremendous clinical consequences. For example, an individual on prolonged bed rest quickly begins to lose bone mineral density (BMD). Conversely, an athlete who engages in a sporting discipline that requires repetitive jumping and landing is likely to have a higher BMD than a sedentary person. Such adaptation is the result of a continuous process of bone resorption and subsequent repair mediated at the cellular level by osteoclasts and osteoblasts, respectively. Advanced cross sectional imaging has demonstrated that bone responds to repetitive loading via a continuum of stress responses that precede the onset of clinical symptoms. In their study involving a cohort of military recruits, Kiuru et al reported that only 40% of the magnetic resonance imaging (MRI) findings suggestive of a low-grade bone stress injury correlated with clinical symptoms. The vast majority of the radiographically detected areas of bone stress reaction remained clinically silent despite uninterrupted training, and disappeared upon follow-up imaging at the conclusion of the 5-month training program. Therefore, under normal circumstances, bone appears able to keep up with necessary repairs without manifesting clinically significant injury as it remodels in accordance with Wolff's law. However, when a bone's reparative and adaptive capacity is overwhelmed by chronic overload, damage can begin to accumulate. If allowed to progress, this multifactorial process may eventually result in a stress fracture. Animal studies have demonstrated that bone subjected to repetitive cyclical loading develops what has been termed microdamage. Furthermore, a physiological threshold appears to exist, below which such microdamage is not detectable. Increased osteoclastic activity at sites of bone stress or strain may cause transient weakening of the bone locally, predisposing the area to microdamage. Unless given appropriate time for healing and osteoblastic-mediated bone deposition, adjacent sites of microdamage are thought to coalesce, giving rise to an area of stress reaction or injury. At this stage, the individual may be minimally symptomatic and conventional radiographs are likely to appear normal. With progressive overload, the bone becomes increasingly vulnerable and the individual proceeds to develop symptoms that are thought to reflect the extent of underlying bone injury. If uninterrupted, the process may culminate in a stress fracture. Some clinicians prefer to distinguish between stress fractures of normal bone that becomes fatigued through abnormal loading (ie, fatigue fractures) and stress fractures of pathologic bone that may fail even under comparatively normal loads (ie, insufficiency fractures). However, both processes are characterized by disrupted bone homeostasis and inadequate repair in the face of repetitive overload. An example of an insufficiency fracture is shown in the images below. A 63-year-old man with metastatic thyroid carcinoma went for a walk and awoke the following morning with left hip girdle pain. 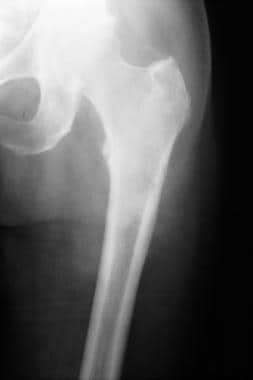 Plain film imaging revealed a subtle area of linear cortical lucency at the proximal left femoral metadiaphysis, consistent with an insufficiency fracture through pathologic bone. The patient subsequently underwent internal fixation. Courtesy of Michael Spieth, MD, and Nandita Bhattacharjee, MD, MHA; Marshfield Clinic Department of Radiology. Enlarged view of the fracture shown in the above image. Plain film imaging revealed a subtle area of linear cortical lucency at the proximal left femoral metadiaphysis, consistent with an insufficiency fracture through pathologic bone. The patient subsequently underwent internal fixation. Courtesy of Michael Spieth, MD, and Nandita Bhattacharjee, MD, MHA; Marshfield Clinic Department of Radiology. Estimates of the annual incidence of stress fractures among athletes and military recruits range from 5-30%. Stress fractures are among the 5 most common injuries suffered by runners and have been reported to account for up to half of the injuries sustained by military recruits. The interaction between genetic susceptibility and other internal and external risk factors determines an individual's likelihood of sustaining a bony stress injury. Stress fractures probably occur less frequently among African Americans than among whites by virtue of the generally higher BMD found in African Americans. Most studies suggest that females are at increased risk of developing stress fractures compared with males. The incidence of stress fractures among female military recruits and athletes has been reported to be twice that of their male counterparts. Disordered eating places females at higher risk of developing stress fractures. The clinician should be mindful that a stress fracture may herald the existence of underlying amenorrhea, disordered eating, and osteoporosis (the "female athlete's triad"). Therefore, diagnosis of a stress fracture in a female should prompt the clinician to obtain a dietary history to ensure adequate intake of both energy (calories) and calcium. Finally, in the proper clinical context, a stress fracture should alert the clinician to the possibility of osteoporosis or other underlying skeletal pathology. Interestingly, some evidence suggests that the risk of stress fracture may be lower among adult runners who have a broad athletic background that includes childhood participation in "ball sports." This finding provides additional incentive for coaches and parents to avoid promoting early sport-specialization among young athletes. Berger FH, de Jonge MC, Maas M. Stress fractures in the lower extremity. The importance of increasing awareness amongst radiologists. Eur J Radiol. 2007 Apr. 62(1):16-26. [Medline]. Hauret KG, Jones BH, Bullock SH, et al. Musculoskeletal injuries description of an under-recognized injury problem among military personnel. Am J Prev Med. 2010 Jan. 38(1 Suppl):S61-70. [Medline]. Evans JT, Guyver PM, Kassam AM, Hubble MJ. Displaced femoral neck stress fractures in Royal Marine recruits--management and results of operative treatment. J R Nav Med Serv. 2012. 98(2):3-5. [Medline]. Corrarino JE. Stress fractures in runners. Nurse Pract. 2012 Jun 10. 37(6):18-28. [Medline]. Briskin SM. Injuries and medical issues in softball. Curr Sports Med Rep. 2012 Sep. 11(5):265-71. [Medline]. Kahanov L, Eberman LE, Games KE, Wasik M. Diagnosis, treatment, and rehabilitation of stress fractures in the lower extremity in runners. Open Access J Sports Med. 2015. 6:87-95. [Medline]. [Full Text]. Miller TL, Kaeding CC. Upper-extremity Stress Fractures: Distribution and Causative Activities in 70 Patients. Orthopedics. 2012 Sep 1. 35(9):789-93. [Medline]. Milner CE, Hamill J, Davis IS. Distinct hip and rearfoot kinematics in female runners with a history of tibial stress fracture. J Orthop Sports Phys Ther. 2010 Feb. 40(2):59-66. [Medline]. Kiuru MJ, Niva M, Reponen A, Pihlajamaki HK. Bone stress injuries in asymptomatic elite recruits: a clinical and magnetic resonance imaging study. Am J Sports Med. 2005 Feb. 33(2):272-6. [Medline]. Waterman BR, Gun B, Bader JO, Orr JD, Belmont PJ Jr. Epidemiology of Lower Extremity Stress Fractures in the United States Military. Mil Med. 2016 Oct. 181 (10):1308-13. [Medline]. Oestreich AE, Bhojwani N. Stress fractures of ankle and wrist in childhood: nature and frequency. Pediatr Radiol. 2010 Feb 24. [Medline]. Changstrom BG, Brou L, Khodaee M, Braund C, Comstock RD. Epidemiology of stress fracture injuries among US high school athletes, 2005-2006 through 2012-2013. Am J Sports Med. 2015 Jan. 43 (1):26-33. [Medline]. Brukner P, Bennell K, Matheson G. Stress Fractures. 1st ed. Melbourne, Australia: Blackwell Science Asia; 1999. Miller JR, Dunn KW, Ciliberti LJ Jr, Patel RD, Swanson BA. Association of Vitamin D With Stress Fractures: A Retrospective Cohort Study. J Foot Ankle Surg. 2016 Jan-Feb. 55 (1):117-20. [Medline]. Davey T, Lanham-New SA, Shaw AM, et al. Low serum 25-hydroxyvitamin D is associated with increased risk of stress fracture during Royal Marine recruit training. Osteoporos Int. 2016 Jan. 27 (1):171-9. [Medline]. Yoder K, Bartsokas J, Averell K, McBride E, Long C, Cook C. Risk factors associated with sacral stress fractures: a systematic review. J Man Manip Ther. 2015 May. 23 (2):84-92. [Medline]. Fayad LM, Kawamoto S, Kamel IR, Bluemke DA, Eng J, Frassica FJ. Distinction of long bone stress fractures from pathologic fractures on cross-sectional imaging: how successful are we?. AJR Am J Roentgenol. 2005 Oct. 185(4):915-24. [Medline]. Smith JT, Halim K, Palms DA, Okike K, Bluman EM, Chiodo CP. Prevalence of vitamin D deficiency in patients with foot and ankle injuries. Foot Ankle Int. 2014 Jan. 35 (1):8-13. [Medline]. Jaimes C, Jimenez M, Shabshin N, Laor T, Jaramillo D. Taking the stress out of evaluating stress injuries in children. Radiographics. 2012 Mar-Apr. 32(2):537-55. [Medline]. Bui-Mansfield LT, Thomas WR. Magnetic resonance imaging of stress injury of the cuneiform bones in patients with plantar fasciitis. J Comput Assist Tomogr. 2009 Jul-Aug. 33(4):593-6. [Medline]. Sanchez TR, Jadhav SP, Swischuk LE. MR imaging of pediatric trauma. Magn Reson Imaging Clin N Am. 2009 Aug. 17(3):439-50, v. [Medline]. Schmid MR, Hodler J, Vienne P, Binkert CA, Zanetti M. Bone marrow abnormalities of foot and ankle: STIR versus T1-weighted contrast-enhanced fat-suppressed spin-echo MR imaging. Radiology. 2002 Aug. 224(2):463-9. [Medline]. Rush JK, Astur N, Scott S, Kelly DM, Sawyer JR, Warner WC Jr. Use of magnetic resonance imaging in the evaluation of spondylolysis. J Pediatr Orthop. 2015 Apr-May. 35 (3):271-5. [Medline]. Arendt E, Agel J, Heikes C, Griffiths H. Stress injuries to bone in college athletes: a retrospective review of experience at a single institution. Am J Sports Med. 2003 Nov-Dec. 31(6):959-68. [Medline]. Ramey LN, McInnis KC, Palmer WE. Femoral Neck Stress Fracture: Can MRI Grade Help Predict Return-to-Running Time?. Am J Sports Med. 2016 Aug. 44 (8):2122-9. [Medline]. Hoffman DF, Adams E, Bianchi S. Ultrasonography of fractures in sports medicine. Br J Sports Med. 2015 Feb. 49 (3):152-60. [Medline]. Nicola TL, El Shami A. Rehabilitation of running injuries. Clin Sports Med. 2012 Apr. 31(2):351-72. [Medline]. Sairyo K, Katoh S, Takata Y, Terai T, Yasui N, Goel VK. MRI signal changes of the pedicle as an indicator for early diagnosis of spondylolysis in children and adolescents: a clinical and biomechanical study. Spine (Phila Pa 1976). 2006 Jan 15. 31(2):206-11. [Medline]. Kuhn KM, Riccio AI, Saldua NS, et al. Acetabular retroversion in military recruits with femoral neck stress fractures. Clin Orthop Relat Res. 2009 Jul 9. [Medline]. [Full Text]. Snyder RA, Deangelis JP, Koester MC, et al. Does shoe insole modification prevent stress fractures? A systematic review. HSS J. 2009 Jun 9. [Medline]. [Full Text]. Anderson K, Sarwark JF, Conway JJ, et al. Quantitative assessment with SPECT imaging of stress injuries of the pars interarticularis and response to bracing. J Pediatr Orthop. 2000 Jan-Feb. 20(1):28-33. [Medline]. Swenson EJ, DeHaven KE, Sebastianelli WJ, et al. The effect of a pneumatic leg brace on return to play in athletes with tibial stress fractures. Am J Sports Med. 1997 May-Jun. 25(3):322-8. [Medline]. Whitelaw GP, Wetzler MJ, Levy AS, et al. A pneumatic leg brace for the treatment of tibial stress fractures. Clin Orthop. 1991 Sep. (270):301-5. [Medline]. Kilcoyne KG, Dickens JF, Rue JP. Tibial stress fractures in an active duty population: long-term outcomes. J Surg Orthop Adv. 2013 Spring. 22(1):50-3. [Medline]. Entwistle RC, Sammons SC, Bigley RF, et al. Material properties are related to stress fracture callus and porosity of cortical bone tissue at affected and unaffected sites. J Orthop Res. 2009 Apr 20. [Medline]. Keeley A, Bloomfield P, Cairns P, et al. Iliotibial band release as an adjunct to surgical management of patellar stress fracture in the athlete: a case report and review of the literature. Sports Med Arthrosc Rehabil Ther Technol. 2009 Jul 30. 1(1):15. [Medline]. [Full Text]. Torg JS, Moyer J, Gaughan JP, et al. Management of Tarsal Navicular Stress Fractures: Conservative Versus Surgical Treatment: A Meta-Analysis. Am J Sports Med. 2010 Mar 2. [Medline]. Yoo JI, Ha YC, Ryu HJ, et al. Teriparatide Treatment in Elderly Patients With Sacral Insufficiency Fracture. J Clin Endocrinol Metab. 2017 Feb 1. 102 (2):560-5. [Medline]. [Full Text]. Ruohola JP, Laaksi I, Ylikomi T, Haataja R, Mattila VM, Sahi T. Association between serum 25(OH)D concentrations and bone stress fractures in Finnish young men. J Bone Miner Res. 2006 Sep. 21(9):1483-8. [Medline]. Lappe J, Cullen D, Haynatzki G, Recker R, Ahlf R, Thompson K. Calcium and vitamin D supplementation decreases incidence of stress fractures in female navy recruits. J Bone Miner Res. 2008 May. 23(5):741-9. [Medline]. McCabe MP, Smyth MP, Richardson DR. Current concept review: vitamin D and stress fractures. Foot Ankle Int. 2012 Jun. 33(6):526-33. [Medline]. McClung JP, Karl JP. Vitamin D and stress fracture: the contribution of vitamin D receptor gene polymorphisms. Nutr Rev. 2010 Jun. 68(6):365-9. [Medline]. This image is of a 17-year-old male wrestler with a 2-month history of left-sided low back pain, worse with extension. Total body scintigraphy findings were unremarkable. Courtesy of Michael Spieth, MD, and Nandita Bhattacharjee, MD, MHA; Marshfield Clinic Department of Radiology. Same patient as in the above image. Single-photon emission computed tomography (SPECT) images demonstrate abnormal delayed uptake in the posterior elements of L5. Courtesy of Michael Spieth, MD, and Nandita Bhattacharjee, MD, MHA; Marshfield Clinic Department of Radiology. Same patient as in the above 2 images. Subsequent MRI revealed an area of bright signal in the left pars interarticularis of L5 on T2-weighted images, confirming the diagnosis of acute unilateral spondylolysis. The patient was treated successfully with activity restriction and bracing with a lumbar corset for 3 months, at which point he was asymptomatic. Plain film imaging at follow-up (not shown) was unremarkable, with no evidence of spondylolysis on oblique views. Courtesy of Michael Spieth, MD, and Nandita Bhattacharjee, MD, MHA; Marshfield Clinic Department of Radiology. A 17-year-old female dancer with a 2-week history of left shin pain. Plain film imaging was unremarkable. Three-phase bone scanning demonstrated an area of linear uptake in the posterior medial aspect of the left tibia on blood pool images, but delayed images were considered normal. This scintigraphic pattern is consistent with medial tibial stress syndrome (shin splints), but not with stress fracture. Courtesy of Michael Spieth, MD, and Nandita Bhattacharjee, MD, MHA; Marshfield Clinic Department of Radiology. This is a 55-year-old female industrial worker with a 1-week history of right foot pain. Plain film imaging was unremarkable. Bone scanning revealed a stress fracture of the second metatarsal. Courtesy of Michael Spieth, MD, and Nandita Bhattacharjee, MD, MHA; Marshfield Clinic Department of Radiology. This image is of an 18-year-old female soccer player with a 3-week history of left leg pain, which was worse at night and with activity. Upon examination, she reported tenderness in response to palpation over the midtibia. Bilateral pes planus was noted. 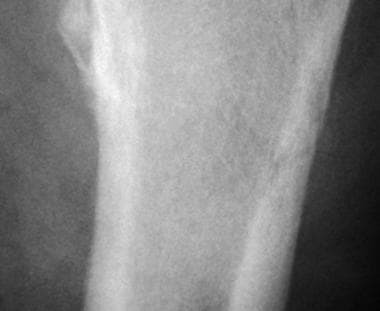 Plain film radiography failed to demonstrate a fracture. Bone scanning revealed a focal area of delayed uptake on the posterior medial aspect of the proximal third of the left tibia, confirming the diagnosis of stress fracture. Courtesy of Michael Spieth, MD, and Nandita Bhattacharjee, MD, MHA; Marshfield Clinic Department of Radiology. This case involves a 16-year-old female basketball player with a 2-year history of left foot pain refractory to casting and reduced weight bearing. Bone scanning revealed a focal area of delayed uptake lateral to the left first metatarsal phalangeal joint, which corresponded to a bipartite sesamoid on plain films. Courtesy of Michael Spieth, MD, and Nandita Bhattacharjee, MD, MHA; Marshfield Clinic Department of Radiology. Sesamoid stress fractures are prone to nonunion, and sesamoidectomy is indicated for patients who do not respond to conservative management. Some clinicians recommend bone grafting as an alternative to complete or partial sesamoidectomy. Courtesy of Michael Spieth, MD, and Nandita Bhattacharjee, MD, MHA; Marshfield Clinic Department of Radiology.